On the surface, the $12 million US gross of 1988’s Cinema Paradiso sounds like pocket change, but placed in context, that total looks pretty good. After all, American audiences rarely embrace Italian movies, so $12 million for a small character tale from across the pond makes it a relative hit, especially when viewed by that era’s box office expectations. When successful director Salvatore Di Vita (Jacques Perrin) learns that someone named “Alfredo” died, he returns to the small village where he lived as a child. As part of this journey, we learn that Alfredo (Phillippe Noiret) acted as the film projectionist in town, and he exposed young Salvatore (Salvatore Cascio) to the wonders of cinema. Via flashbacks, we see aspects of Salvatore’s childhood and also his adolescence (Marco Leonardi). In particular, we learn of his teen romance with Elena Mendola (Agnese Nano) and see how this impacted the rest of his life. While I knew of Paradiso back in 1990 – when the 1988 film finally got a US theatrical release – I never saw it. Some of that came due to my age, as I was just 22 in early 1990 and not particularly interested in foreign flicks unless they boasted lots of hot, naked babes. I also just didn’t think Paradiso would do much for me. As I recall, the movie’s ad campaign made it look awfully sentimental and cutesy, traits that failed to endear it to me in 1990. Or now, for that matter, as my tolerance for sappy emotion and nostalgia hasn’t changed much over that span. However, I knew of the film’s positive reputation and felt willing to give it a chance to see if it offered something more than whimsy and obvious emotions. Now that I’ve seen Paradiso, I might have to give credit to my 22-year-old self. I think he got this one right, as I can’t find much about Paradiso to make me regret my choice not to see it until 2017. Note that for this review, I chose the 174-minute “Director’s Cut” and not the 124-minute 1988 theatrical version. Would my opinion of the film differ if I’d gone with the shorter rendition? Perhaps. Part of my complaint stems from the seemingly never-ending run of clips from old movies, and I’d guess that the shorter cut uses few of these. I still think my overall impression would remain largely the same. I might feel less bored with the 124-minute edition since I’d have to spend less time with it, but basic length isn’t the real issue. I felt disenchanted with Paradiso 30 minutes into it, so it’s not the nearly three-hour running time that wore me down. I just don’t connect to the material. Given my lifelong affection for film, I feel like I should, as so much of Paradiso seems to exist to celebrate the art form. I emphasize “seems to”, though, because Paradiso’s praise for movies feels tangential and superficial. The scenes at the theater don’t do much more than fill time, as we don’t really get a sense of the format’s wonder and magic. Not that the film doesn’t try to sell us on that notion, as it consists of many shots in which little Salvatore watches the screen in wonder. Unfortunately, the movie depicts the exhibited flicks in such a way that we don’t get much of an impression of them. They impact the audience and Salvatore for reasons that we don’t truly understand, as Paradiso doesn’t convey their meaning well. The movie’s incessant sense of mawkish sentimentality doesn’t help. People condemn these traits when Hollywood churns them out but they seem to feel more accepting of them in foreign films, and I can’t explain why. Paradiso shoves its emotions down our throat in a heavy-handed manner that makes it tough to swallow. Young Cascio brought one quality to his performance as little Salvatore: cuteness. As an actor, though, he showed no skill. The kid chirps, shouts, mugs and hops through the film without anything other than broad hamminess to bring to the table. The adult actors fare better, but the movie’s rambling nature and focus on broad sentiment zaps their performances. Every once in a while, Paradiso seems to shoot for a hint of greater social consequence – mainly related to World War II – but it never digs into these areas with depth. Some of this makes sense due to the tale’s Salvatore-focused perspective, but we still find ourselves left with a superficial story packed with shots of an adorable urchin. Paradiso doesn’t change much once we get to teen Salvatore, as we stay with lots of movie clips and cheap melodrama. I know the story intends to convey the role the local cinema plays in the community but it just feels like a long montage of movie clips without much real purpose. Paradiso winds up as a movie about a passion for movies that conveys no passion for movies – or anything else. If it intends to be emotional and moving, it fails, as we find not an ounce of spirit or romance or heart across its running time. Because the characters remain bland and forgettable, I never connected to this long, slow movie. Cinema Paradiso appears in an aspect ratio of approximately 1.66:1 on this Blu-ray Disc. This became a pleasing presentation. Overall definition seemed nice. A smidgen of softness could hit some wider shots, but most of the movie appeared accurate and well-defined. I saw no shimmering or jagged edges, and both print flaws and edge haloes failed to mat the proceedings. With a good sense of grain structure, I didn’t suspect any digital noise tampering. In terms of colors, Paradiso opted for a pretty natural palette. The movie offered warm, rich hues that suited the material. Blacks were dark and deep, and shadows usually seemed fine. A couple of low-light shots appeared slightly dense, but not to a distracting degree. Ultimately, the transfer worked nicely. 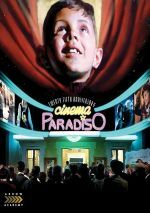 A gentle, nostalgic film like Cinema Paradiso doesn’t seem likely to boast a slam-bang soundtrack, and its DTS-HD MA 5.1 audio seemed appropriately subdued. As I anticipated, music played the most important role, as the score filled the various speakers in a satisfying manner. Effects were more limited. Occasionally I heard elements that spread to the side/rears, but not often, and not with much breadth. Outside of the music, the track usually felt fairly monaural, so don’t expect a lot of involvement via the side or surround channels. Audio quality varied but remained acceptable. Speech became the weakest link, mainly due to a fair amount of dodgy looping. I may not have seen a ton of Italian movies, but I know they love their re-recorded dialogue – so why did they usually do so in such an unconvincing manner? I don’t know, but Cinema suffered from a lot of speech that felt unnatural and didn’t connect well with the footage. Many lines didn’t seem to synch up with mouth movements in an especially natural manner, and even when they did, the dialogue still came across as canned and fake. Otherwise, the track seemed fine. Music fared best, as the score appeared warm and lush. While they lacked much to do, effects remained reasonably clear and accurate. This seemed like a perfectly average track for its era. This package includes a mix of extras, and it provides two different versions of the Paradiso. In addition to the 1988 theatrical version (2:03:50), we get a 2002 Director’s Cut (2:53:31). Of the film’s three parts, the third act gains most of the extra material. I compared the two editions at a few “checkpoints” to gauge the differences, and the first half of the theatrical version remains almost entirely intact for the DC. The “new Cinema Paradiso” opens at 56:35 in the shorter rendition and it comes at 58:43 in the longer one, so if you hope to see a lot more of young Salvatore, you’ll encounter disappointment. Adolescent Salvatore gets more of a boost, as the second act earns a moderate amount of extra running time. Adult Salvatore returns home at 1:42:02 of the theatrical and 2:01:29 of the DC, so Teen Salvatore gains about 17 minutes of footage. If you’ve already done the math, you’ve figured out that Adult Salvatore receives the lion’s share of the longer version. More than 30 minutes of extra footage enters that part of the movie, and this means that the final 21:48 of the theatrical version stretches to the last 52:21 of the DC. Much of this material revolves around a deleted character: Adult Elena (Brigitte Fossey) doesn’t appear in the theatrical version but she receives lots of screentime in the DC, as Salvatore finds out what happened to her. Whether or not these additions work depends on the viewer, but they clearly change the narrative, as they alter our perceptions of Alfredo and make him more manipulative than in the sunnier theatrical version. The longer cut seems more melancholy and less overtly nostalgic due to the inclusion of this semi-dark story element. Most of the extras appear on the theatrical Blu-ray, and these bring us an audio commentary from writer/director Giuseppe Tornatore and film historian Millicent Marcus. This gives us a running, screen-specific chat from Marcus into which we find the occasional recorded remark from Tornatore. The filmmaker offers a few moderate insights, but he appears too infrequently to deliver much information of merit. That means Marcus dominates the commentary, and she fails to bring it to life. While Marcus presents occasional thoughts about themes, interpretation and production areas, she mainly just narrates the movie. Since we can see it for ourselves, Marcus’s remarks add little and turn this into a slow, semi-pointless discussion. A few video programs follow. A Dream of Sicily goes for 54 minutes, 45 seconds and presents comments from Tornatore, director Francesco Rosi and painter Peppino Ducato. A mix of memories, clips from films and home movies, “Dream” looks at Tornatore’s life and what influenced his work. This becomes a somewhat rambling but still generally interesting view. During the 27-minute, 26-second A Bear and a Mouse, we hear from Tornatore and actors Philippe Noiret and Salvatore Cascio. The program looks at the movie’s origins and aspects of the production. “Mouse” manages to give us a solid overview of the film and becomes the best of the disc’s behind the scenes elements, though the now grown-up Cascio seems desperate to look like Bono. Finally, The Kissing Sequence fills seven minutes, one second. It offers notes from Tornatore as he discusses the casting of a minor part that almost involved a famous director. The featurette also relates the movies from which the flick’s “kissing montage” comes, so it ends up as a useful piece. In addition to two trailers, the set concludes with a booklet. It presents photos, credits and an essay from film lecturer Pasquale Iannone. The booklet ends the package on a positive note. As either a celebration of movies or a nostalgic view of childhood, Cinema Paradiso flops. Packed with tacky sentiment and little actual emotion, the film plods and fizzles. The Blu-ray provides very good picture with a mix of supplements and mediocre audio. Paradiso turns into a dull disappointment.